Support had been declining for 15 years. 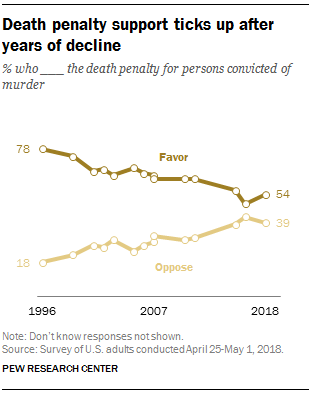 Over the last two decades, public support for the death penalty has been on the decline. In 2016, the number of people in favor of capital punishment was 49 percent—the lowest it had been in more than 40 years. But a new Pew Research Center survey shows a reverse of that trend for the first time since 2003. Today, 54 percent of Americans are in favor of executing those convicted of capital murder. The last time there was such backing was in 2013, when 55 percent of Americans supported capital punishment. The all-time high was in the mid-1990s when Pew found that 78 percent of Americans were in favor. Death penalty support has always been divided by race and gender. In 2016, 55 percent of men supported the death penalty, two years later that number has increased to 61 percent. This year, women’s support for the death penalty has jumped up from 43 percent in 2016 to 46 percent. In the 2018 survey, 59 percent of white people supported the death penalty, up two points from 2016. Even among black people, who have long opposed the death penalty because of its racial bias, the percentage of this in favor increased from 29 to 36. The increased support was also bipartisan. In 2016, 72 percent of Republicans supported the death penalty, while just 34 percent of Democrats did. Two years later, those numbers have ticked up to 77 and 35 percent respectively. Among independents, that number has increased from 44 percent to 52 percent. Nineteen states have banned capital punishment, but 31 states still have it on the books. But only a handful of states continue to execute inmates—in 2018, 11 people have already been executed. The greater support for capital punishment has taken place against the backdrop of fewer executions taking place in the United States than in decades past, and a president who has upped the rhetoric in favor of executing criminals. Donald Trump has always been a proponent of the death penalty. In 1989, after a woman was raped in New York’s Central Park and five brown and black teenagers were accused—and later exonerated—he took out full-page advertisements in the city’s newspapers demanding the return of the death penalty. He has repeatedly called for the death penalty for people who kill law enforcement officers. In February, he announced that he would also like to seek the death penalty for drug dealers in an effort to combat the opioid crisis.